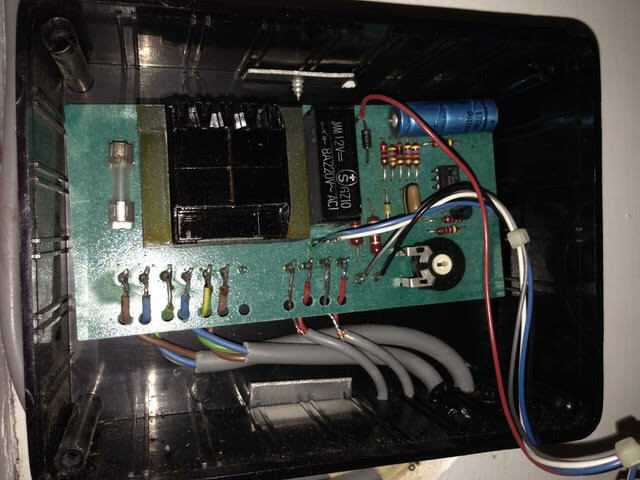 Pictured below is the differential temperature controller fitted to a 1980’s solar hot water system. After many years of successful operation, this controller finally failed (pump stays on all the time) and needed to be replaced. Something functionally identical was required, at least externally for the benefit of the user, so we were tasked to build a differential controller with relay to switch a mains powered pump, and to include a power on LED indicator, a pump on LED indicator, and a physical switch to select between standard automatic operation and ‘override’ which forces the pump to run. The internals of the old controller are pictured above. It shows a simple system with mains power going in and coming out again on its way to the pump switched by a relay, a transformer to get low voltage DC from the incoming mains AC, a potentiometer which is probably there for the installer to set the temperature differential required between solar panel and hot water tank for the pump to be turned on or to zero the measured difference when the sensors are at the same temperature, and the connections (two core) for two temperature sensors which are almost certainly going to be thermistor type sensors. There is also an IC visible which will most likely is a microcontroller, a 555 timer, or a comparator. The sensor leads (and all other leads) were soldered in place upon installation, and the sensor cables were run through walls and are therefore inaccessible. Since the existing cables were 2-core, we had to build the new controller using sensors with two connections – LM335 – rather than the 3 connection digital sensors we use in most of our controllers – DS18B20 temperature sensors. 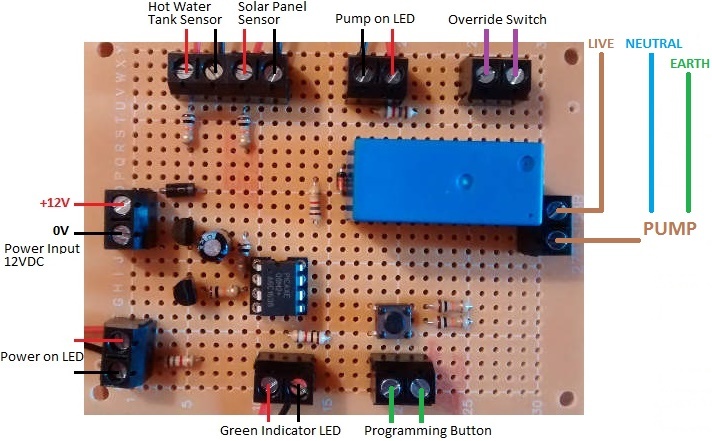 Our 2013 Solar Water Heating Pump Controller is the most similar unit we sell to this existing controller, so used that as the foundation of the controller we built. All LEDs, buttons, and switches have to be external to the controller board, so these have extended leads which connect via screw in terminals. We supplied a plug in 12VDC power supply rather than fitting a transformer directly to the circuit board, and we added an LED which turns on when the unit is powered, and the override switch which can be used to force the pump to run. 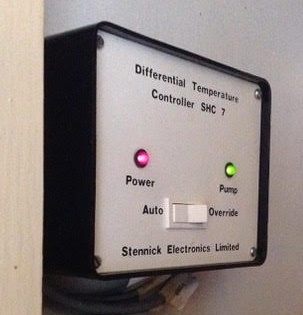 We fitted the programming button (used to set the temperature differentials at which the pump turns on and turns off) to the circuit board, but connected terminals in parallel with it so that an external button can be panel mounted now or at a later date. If you need a modified version of one of our differential temperature controllers, please email neil@reuk.co.uk with details of your requirements.